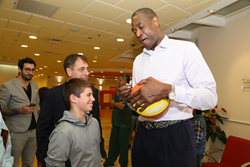 The NBA all-star Dikembe Mutombo made his first trip to the Middle East’s largest hospital, Sheba Medical Center, on Thursday, November 29th. The visit marked the beginning of a partnership that could bring Sheba’s sophisticated medical knowledge to the Democratic Republic of Congo as soon as 2019. Mutombo signs basketball of excited fan. I have been greatly inspired by my visit to Sheba Medical Center and have seen some amazing technology. I believe that Sheba's humanitarian mission staff will be a great help to my people at the hospital I built in the Democratic Republic of Congo. Beloved NBA player and Hall of Famer Dikembe Mutombo visited Israel’s Sheba Medical Center, Tel HaShomer last week to forge a collaboration between the Middle East’s most advanced hospital and Mutombo’s own medical center in his home country, the Democratic Republic of Congo. Mutombo met with with Sheba’s executives to discuss the details of their partnership. He then toured the Edmond and Lily Safra Children’s Hospital and The Edmond J. Safra International Congenital Heart Center, where he visited with sick Israeli and Palestinian children and gave away autographed basketballs to excited fans. He also got to experience firsthand the virtual reality technology at Sheba’s Rehabilitation Hospital. The shared goal between the partners is to provide Sheba’s advanced medical knowledge to the Biamba Marie Mutombo Hospital – named after Mutombo’s mother – which the NBA star founded in the DR of. Congo in 2007 as a personal project formed from his long-time interest and passion for healthcare. “I believe that healthcare is a human right. It doesn’t matter where you come from. I believe that everyone who is born, that is living on this earth, should have access to healthcare,” said Mutombo. Sheba’s leadership team was honored by the prospects of a future partnership, as it reflects their mission in providing healthcare to the Middle East region and the entire world. They have a long history of humanitarian efforts, such as their medical assistance provided to Zambia amidst a devastating cholera outbreak.